Tinea capitis is the most common pediatric superficial dermatophyte infection. 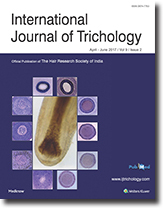 The causative species vary, as for instance, Microsporum canis predominates in Europe, while Trichophyton tonsurans predominates in North America. Tinea capitis does not respond well to topical therapy alone, thus oral therapy is requisite. The drug of choice is griseofulvin; however in some countries, it is no longer available. Fungal culture should be requested in the persistent, scalp lesion and trichoscopy can put forward a speedy diagnosis by its characteristic findings. Scalp dermoscopy or “trichoscopy” represents a valuable, noninvasive technique for the evaluation of patients with hair loss due to tenia capitis. It is simple, quick, and easy to perform. Background: Development of trichobezoars in children is primarily a psychiatric issue more than a pediatric surgical ailment. A definite history of trichotillomania and trichophagia may or may not be elicited. Surgical removal is required in patients presenting with huge bezoars. Psychiatric follow-up is of utmost importance to avoid recurrence. Materials and Methods: Records of children who were diagnosed and managed for the presence of gastric trichobezoars were retrospectively reviewed. Results: Five children presented over past 15 years (2000–2015) with varied presentations ranging from asymptomatic abdominal masses to features of bowel obstruction. There were three adolescent females (aged 10, 12, and 13 years) and two males (aged 2 and 6 years). All had a hugely distended stomach completely filled with the bezoar. After gastrotomy and removal of the bezoar, gastrostomy drainage was provided in three of these five patients whereas the remaining two had nasogastric tube in place. All three with gastrostomy had effective gastric decompression and oral feeds could be established early. On the other hand, remaining two in which gastrostomy was not inserted had prolonged adynamicity of the stomach and delayed establishment of oral feeds. Conclusion: A procrastinated history results in a hugely distended stomach which remains adynamic for a long period of time after removal of the bezoar, and decompression by gastrostomy tube drainage in the postoperative period is a feasible option. Background: Reconstructive hair fibers are an innovative tool in cosmetic dermatology based on electrostatic adherent powder which bonds to the hair shaft and can disguise hair loss in men and women. Aim: This study aims to analyze and compare five different brands of organic hair fibers. Materials and Methods: A scanning electron microscope (SEM) was used to obtain amplified images of samples to study their shape and morphological structure. X-ray microanalysis was performed to study the chemical composition of reconstructive hair fibers. The five samples were tested in patients attending a trichology unit of a tertiary hospital. Results: The main component in hair fibers products 1 (Blum Secret™) and 3 (Keratin™) was cotton (cellulose of vegetal origin), while product 2 (Viviscal™) was made of a vegetal keratin. All three samples appeared as parallel-arranged fibres on the scanning electron microscope. The X-ray microanalysis showed an organic polymer mainly composed of C, O, and Si. Hair fibers 4 (Toppik™) and 5 (Nanogen™) were similar. Sample 4 derived from a keratin organic fiber and sample 5 from pure, positively charged keratin. In both cases, SEM revealed microfibers covered by a fine squamous. The X-ray microanalysis in both cases revealed a high presence of S. Conclusion: There was no discrepancy among the cosmetic results of the five samples, providing a successful esthetic effect in all of our patients despite the chemical differences found in the X-ray microanalysis. Introduction: Scalp care is essential because it determines the health and condition of the hair and prevents the diseases of scalp and hair. The objectives of our study were to correlate race and hair types, to determine the awareness of hair care among Malaysian medical students, and to distinguish the factors that affect the health of hair and scalp. Methodology: It was a cross-sectional study wherein validated questionnaires were given to 240 medical undergraduate students who belonged to three ethnic races of Malaysia, i.e., Chinese, Malay, and Malaysian Indians after their informed consent. The results were then analyzed using percentage statistics. 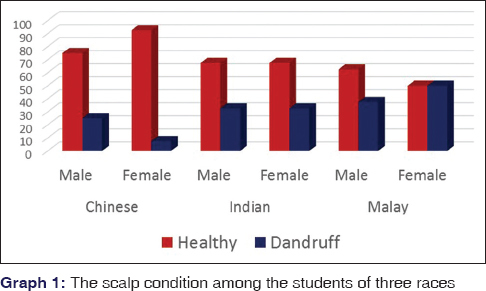 Results: Chinese students had comparatively healthier scalp without dandruff. Most Chinese and Indians had silky type of hair while Malay had dry, rough hair. Chinese and Indians colored their hair and used various styling methods; while among the Malays, this percentage was very less. Regarding hair care practices, males used only shampoo and females used shampoo and conditioner for hair wash. Students also faced dietary and examination-related stress. Conclusion: Results indicate that there exist morphological differences in hair among the studied population. Since most students color their hair and employ various hairstyling methods, they should be educated regarding best hair care practices to improve their scalp hair condition and health. Congenital alopecia universalis is one of the rarest anomaly which involves skin and appendages. The inheritance pattern can be autosomal recessive, X-linked recessive, or autosomal dominant. However, the most common is autosomal recessive form and it is the most severe phenotype. Twenty-nail dystrophy refers to the condition in which all the twenty nails are affected in the form of excessive ridging and nail plate roughness leading to unsightly lustureless nails. 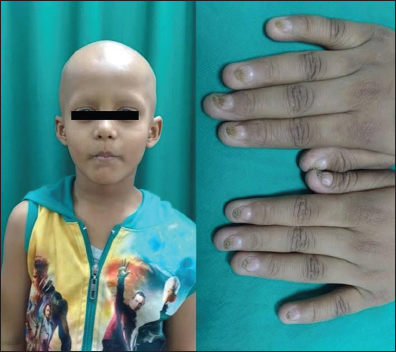 We report a rare case of two siblings with alopecia universalis congenita with twenty-nail dystrophy. To the best of our knowledge, this case is the first case to be reported with such association in both siblings. 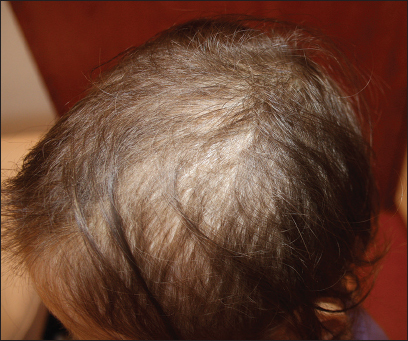 This case reports highlights the fact that alopecia areata is an autoimmune disease with a genetic predisposition as in our case both siblings had alopecia universalis and nail dystrophy. There was no evidence of any other ectodermal dyplasia and had normal teeth and seat glands. The skin biopsy ruled out congenital atrichia and was suggestive of alopecia areata. Ichthyosis follicularis, alopecia, and photophobia (IFAP) syndrome is a rare genetic, oculocutaneous disorder. So far, about forty patients have been reported worldwide. This disorder results from mutations in the membrane-bound transcription factor protease site 2 gene that impairs cholesterol homeostasis and the ability to cope with endoplasmic reticulum stress. We report this rare case of IFAP with atypical presentation and it was interesting to note that alopecia in this child was confined to eyebrows; this unique presentation has not been described earlier. This rare oculocutaneous disorder requires proper documentation so that identification of its variants may be possible in the future. Hair casts (HCs) are thin, elongated, firm, whitish cylindrical concretions which ensheath the hair shaft and can be easily dislodge. They are of two different types: peripilar and parakeratotic keratin cast. Due to its clinical resemblance to pediculosis capitis, the entity is also known as pseudonits. Al though not unusual, false diagnoses are common, and thus, it is very important to correctly differentiate it from other similar conditions. We report here a case of HC involving scalp as well as body hair in association with androgenetic alopecia in a 22-year-old male patient. The patient's sister was also affected with pseudonits. Trichoscopy is a noninvasive visualization tool used to more accurately diagnose hair and scalp disorders. 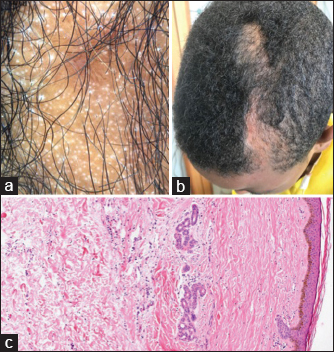 Alopecia areata (AA) in the patient of African descent can mimic the early signs of central centrifugal cicatricial alopecia (CCCA), especially if the initial presentation of hair loss occurs on the central scalp. Two African-American women presented with singular round-ovoid patches of decreased hair loss on the central scalp. 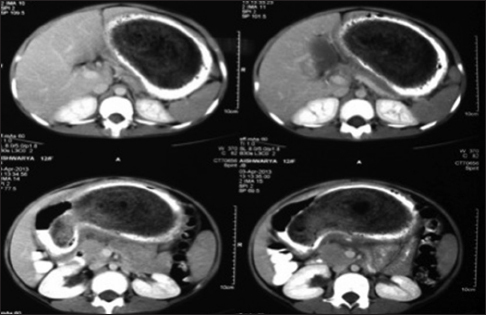 Given the clinical presentation, CCCA was the working diagnosis. However, using dermoscopy, the patients were found to have exclamation hairs and short broken hairs on a background of honeycomb-like pigmented network and regular pinpoint white dots consistent with AA. The diagnosis was confirmed on biopsy. We demonstrate the role of dermoscopy for diagnosing AA in the patient of African descent. Lichen planopilaris is a form of lymphocyte-mediated primary cicatricial alopecia characterized by perifollicular scaling progressing to patches of alopecia depending on the clinical variant. The course is relentlessly progressive and chronic. Hence, early diagnosis and institution of therapy are imperative to halt the disease progress. Although definitive diagnosis is made by scalp biopsy, the detection is usually delayed. Dermatoscopy helps in early recognition of this condition which at that stage is clinically invisible. 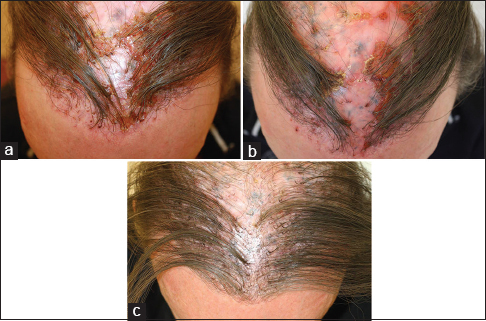 We report a 23-year-old female who presented with hair loss and scalp scaling without clinically obvious patches of alopecia. An increase in length, curling, pigmentation, or thickness of eyelashes is termed eyelash trichomegaly. It may be inherited as an isolated trait or as a feature of a congenital syndrome such as Oliver-McFarlane syndrome or oculocutaneous albinism. Acquired conditions associated with eyelash trichomegaly include HIV infection, connective tissue disorders, and the administration of drugs such as cyclosporine and topical latanoprost. 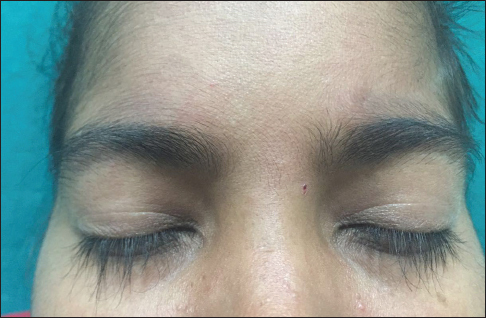 We hereby report a rare case of acquired eyelash trichomegaly with diffuse hair loss and “lupus hairs” on the scalp in a 16-year-old female diagnosed with systemic lupus erythematosus. 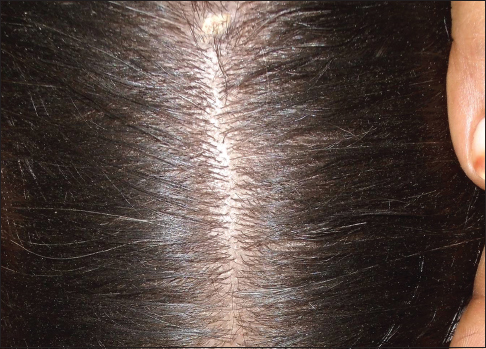 Synthetic hair implants are considered in alopecia when the patient requests an immediate result with minor surgery and with a poor donor area. However, the procedure has historically been marred by poor quality fiber and performance resulting in serious complications. Nevertheless, companies continue to market the procedure with the claim that previous problems have been sorted out. 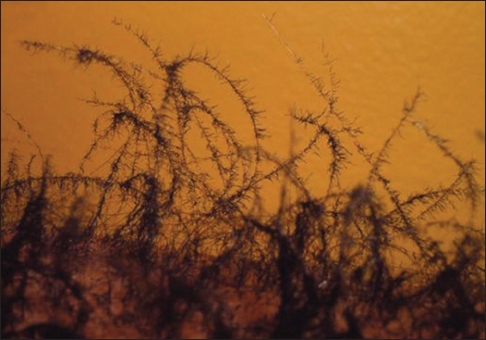 We report a case of inflammation in synthetic hair implants, in which microbiological studies revealed infection with Staphylococcus lugdunensis and Trichophyton tonsurans. The procedure was performed by a hair stylist. The patient experienced symptoms at the site of the implants. Nevertheless, he had the artificial implants repeated. Despite persistent symptoms of peri-implantitis, medical assistance was not sought. It is the view of the International Society of Hair Restoration Surgery that artificial hair fiber implants represent a surgical procedure and as such should be confined to experienced and licensed medical doctors in a reputable medical clinic. As with any surgical procedure, complications may occur which should be handled under a physician's care. Usually, problems result from lack of asepsis during the procedure, lack of patient hygiene, excessive quantity and density of implanted fibers in one session, incorrect choice of implant area, and poor aftercare. In cases, where implant-related problems cannot be resolved within 15 days of antibiotic and anti-inflammatory treatment, an extended microbiological work-up is warranted, and it may be necessary to remove the fibers that may harbor microbial biofilms. Tyrosine kinase enzymes are an attractive target for anticancer therapies. Tyrosine kinase inhibitors (TKI) are well tolerated; somehow severe systemic side effects are rarely seen during treatment. Toxicities of skin and appendages may lead to poor compliance, psychosocial inconvenience, and drug interruption. Changes of the hair can arise following cures with TKI. Nilotinib, a second-generation TKI, has been responsible for various cutaneous side effects including different clinical presentations of alopecia (scarring and nonscarring forms). 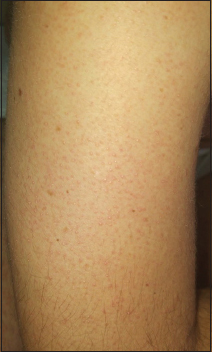 This paper reports the case of a 45-year-old male diagnosed with chronic myelogenous leukemia (CML) treated with nilotinib, who presented with a keratosis pilaris (KP)-like eruption, autoresolutive alopecia areata plaque of the wrist and diffuse eyebrow thinning. To date, eight cases of nilotinib-induced KP were reported. However, none of them was associated with alopecia areata. Hence, physicians need to be aware of this new cutaneous side effect and investigating the reason of this phenomenon requires additional studies.